Introduction to Fiber-Optic Communications provides students with the most up-to-date, comprehensive coverage of modern optical fiber communications and applications, striking a fine balance between theory and practice that avoids excessive mathematics and derivations. Unlike other textbooks currently available, this book covers all of the important recent technologies and developments in the field, including electro-optic modulators, coherent optical systems, and silicon integrated photonic circuits. Filled with practical, relevant worked examples and exercise problems, the book presents complete coverage of the topics that optical and communications engineering students need to be successful. 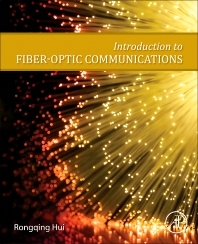 From principles of optical and optoelectronic components, to optical transmission system design, and from conventional optical fiber links, to more useful optical communication systems with advanced modulation formats and high-speed DSP, this book covers the necessities on the topic, even including today’s important application areas of passive optical networks, datacenters and optical interconnections. Dr. Hui (h-index: 20) is a professor of Electrical Engineering and Computer Science at the University of Kansas. His research interests are in lightwave communication systems and subsystems, photonic devices, optical instrumentation and photonic sensors. Prior to joining the faculty of the University of Kansas in 1997 he taught undergraduate and graduate courses in optical communications, microelectronic circuits, and semiconductor materials & devices for more than 15 years. Dr. Hui was a member of the scientific staff at Bell-Northern Research and Nortel in Ottawa, Canada, where he was involved in the research and development of high-speed optical transport networks. He was a NSF Program Director for the photonic devices program from 2006 to 2008. He served as an associate editor for IEEE Transactions on Communications from 2001 to 2007 and an associate editor of IEEE Journal of Quantum Electronics from 2006 to 2013.